JJN is a city-wide network organized in accordance with RA 9344 or Juvenile Justice System and Welfare Act of 2006. 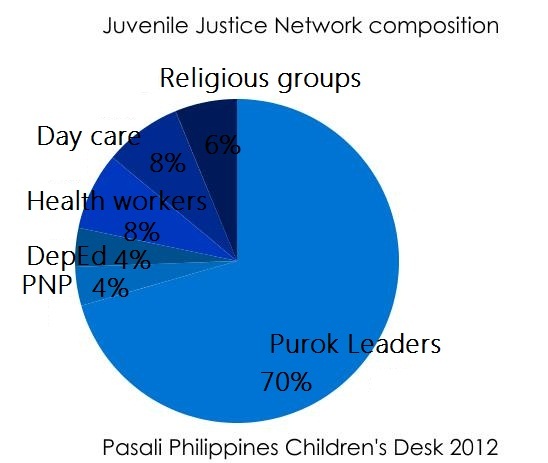 It is composed of various sectors from government and non-government organizations that looks into the possibilities of providing appropriate services and interventions to rescued juvenile delinquents in the light of restorative justice. It has rotational monthly meetings in the 26 barangays( main villages) of General Santos City. All major concerns that are discussed and need immediate attention are then carried out to the City Council for the Protection of Children (CCPC), where PASALI is one of the members. Through the monitoring& lobbying work of non government organizations like Pasali and many others, the government units involved are reminded,challenged and strengthened as well to protect the rights of these Children in Conflict with Law (CICL). PASALI Philippines Foundation, 2005-2012 | Fil-Am road, Purok 11-C, Barangay Fatima, General Santos, Mindanao 9500, Philippines (+63) (083) 5521155 | pasaliphilippines@yahoo.com.ph | Registered non-profit SEC CN200525083 | TIN 005-979-086 Migrants’ initiative transforms community through technology and Tri-people empowerment.